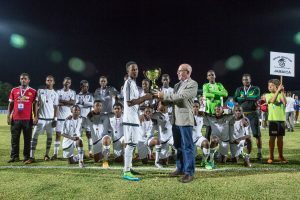 GEORGE TOWN, Grand Cayman – On Saturday Cavalier Soccer Club lifted the Cayman Airways U-14 Invitational Youth Cup after beating Tottenham Hotspur 2-0 in an entertaining final at the Truman Bodden Sports Complex. Fabian Whorms, CEO, Cayman Airways, presents the 2016 Cayman Airways Invitational Youth Cup to winners Cavalier FC. Cavalier SC, coached by Raymond Watson, started aggressively from the opening whistle. This style paid dividends when forward Shanthamoi Brown scored in the 5th minute, his ninth goal of the tournament. Dwayne Allen had a chance to put the team from Kingston, Jamaica further ahead a few minutes later when he collected the ball from midfielder Tahje Tulloch but missed wide of the target. Tottenham, the favourites coming into the tournament, had a potential equaliser disallowed because the player was whistled for being offside. The London side was under constant pressure in the first half, with a ball hitting the post from a defender’s head as he attempted to clear the ball in the 26th minute. It bounced safely back into play and eventually cleared from danger. Trailing 1-0 at the half, Tottenham dominated the early possession in the second frame. A chance, however, would present itself to Cavalier when Brown found himself all alone only to be denied by Joshua Oluwayemi, who pounced from the Tottenham goal to block the attempt. Allen, too, had another opportunity in the 58th to make good on his earlier miss. This time, he evaded the keeper and missed a wide open net. The Cavalier lead would be doubled six minutes later when speedster Dwayne Attkinson took the ball from inside his team’s half, dribbled past defenders and hammered it home low and to the left of Oluwayemi, who hardly stood a chance. The entire Cavalier team on the field and the bench celebrated wildly with victory now in sight, as did their fans in the stands. Tottenham did not give up, as they continued to attack the Cavalier goal but none of their efforts paid dividends. As Orville Smikle recorded his fourth clean sheet in five matches, surrendering only one goal in the tournament. Hon. 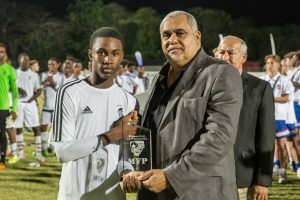 Osbourne Bodden, Minister of Community Affairs, Youth and Sports, presents the MVP award to Shanthamoi Brown of Cavalier FC. Earlier, Gillingham FC (England) needed a penalty shootout to beat Harbour View FC (Jamaica) to secure third place. In a keenly contested fixture, both teams created chances but failed to convert in the first half. Gillingham edged ahead with a 50th minute score from Charlie Blanks off a rebound. Joe Walsh made a critical save four minutes later to keep his side in front but in the 64th minute, Harbour View pulled level when Ronaldo Robinson gathered the ball in the box and curled it into the top left hand corner. Two 10-minute extra periods provided no separation between the sides and it was on to penalty kicks. Harbour View’s Romaye Davis missed his team’s first attempt, which proved to be the difference maker as Gillingham converted all five to seal the win. It was redemption for Gillingham, who lost on penalties to Tottenham 24 hours earlier in the semi-finals.